DEFINITIVE STUPA DESIGNS FOR THE F.P.M.T. 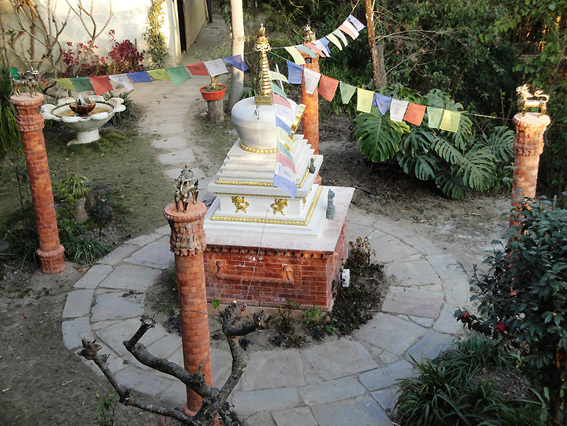 I have taken an interest in stupa construction for some years and have built a 2m high Enlightenment stupa in our garden in Nepal. I took as a basis the grid produced by Ven. Tenpa Choden, manager of Kopan gompa in Nepal, which has been widely used within the FPMT. On the direction of Lama Zopa Rinpoche, that grid was drawn on the basis of a text which which was in Serkong Dorje Chang's monastery in Nepal. Some corrections were made after consulting a Gudmed tantric college text about stupas. The drawings of the other 7 types of stupas were produced on the basis of that Enlightenment stupa grid after consulting the Gyudmed text and seeking further advice from Rinpoche. These drawings are architectural drawings for stupa construction, as the traditional Tibetan grids are often confusing when they attempt to depict 3 dimensions within one 2 dimensional drawing. If I can be of assistance please feel free to email me. The 2m high Enlightenment stupa in our garden. The 4 pillars with lions were added on the instructions of Kyabje Lama Zopa Rinpoche (similar to those sometimes seen in front of Newari temples in Nepal), as were the 4 strings of prayer flags.